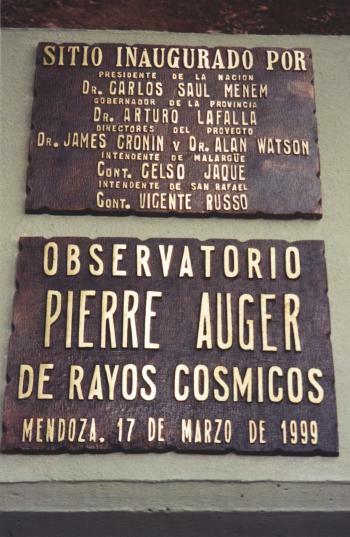 Pierre Auger Observatory: A plaque placed at the Southern Hemisphere detector site in Mendoza, Argentina, for the groundbreaking ceremony. I have interests in all aspects of high energy astroparticle physics, with special interest in the very highest energy cosmic rays. I was head of the Haverah Park extensive air shower project from 1976 until its closure in the early 1990s. This project produced the first evidence for the absence of the celebrated Greisen-Kuzmin-Zatsepin cut-off in the cosmic ray energy spectrum above 4.1019 eV, in addition to providing key data relating to the arrival distribution and mass composition of cosmic rays. 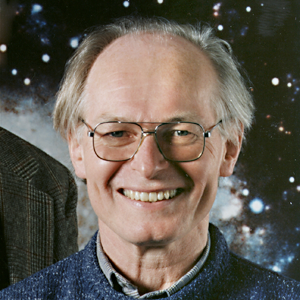 The Haverh Park group was also involved in searches for gamma ray sources at energies around 1 PeV. More recently research interests of broadened to embrace work at the South Pole aimed at elucidating the mass composition of cosmicr rays in the region of the knee at 1 PeV using a shower array and the AMANDA neutrino detector. Interest in the highest energy cosmic rays continues through collaboration with the Auger project, a world wide effort to construct detectors of 3000 sqkm in Argentina and the USA to push knowledge of the highest energy cosmic rays still further.